I am completing a nativity scene in response to my time in Peru. I love all the vivid colors there. No one is afraid of deep blue, bright orange or a green that pops with life. I saw donkeys and alpacas when I visited Peru. It was fun to add these animals to the scene. I used watercolor and pen and ink on 300 lb. watercolor paper. My watercolors are from Daniel Smith. 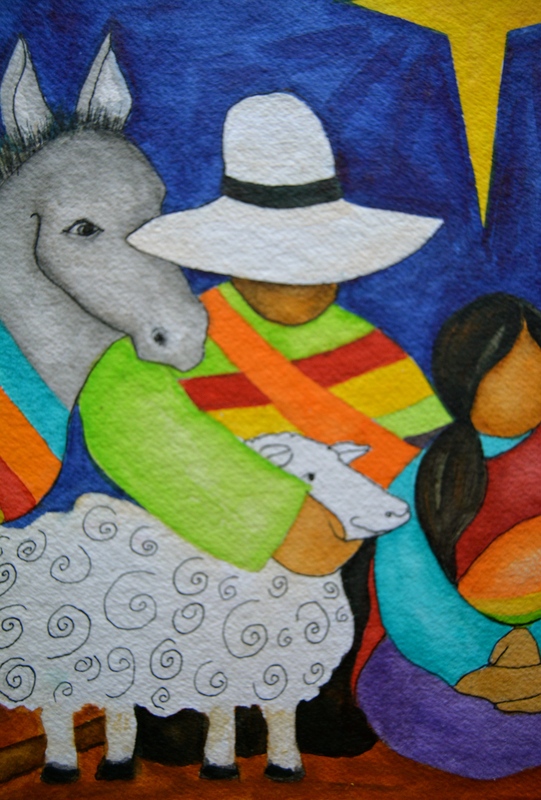 It was fun working with bright colors while contrasting them with the white hats and white sheep. I am in the land of being post chemo, but not free of its effects. I have more strength, but not enough to really run around or work all day long. I know how to lie in bed and do nothing but listen to quiet music as I moan from pain. I know how to run around non-stop with lots of energy. However, this land of some energy is a hard one to navigate. I get a spurt of energy and think for a moment that, just maybe, I don’t have stage 4 breast cancer. Maybe I am fine! That joyous thought is quickly swept away when I get tangled in my yards of oxygen tubing or my side begins to ache because of the cancerous fluid remaining in my right lung. I’m rudely jerked back to my current reality. I am sick. And, it is a long journey to get somewhat better. 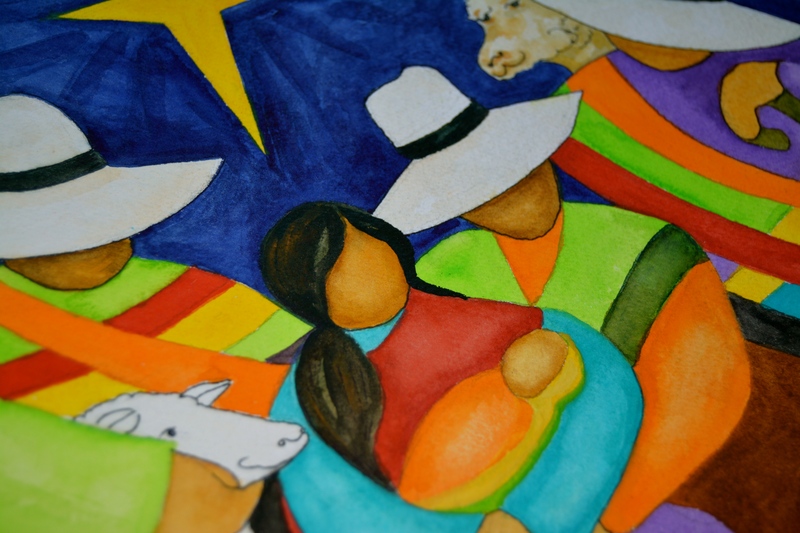 Then, I sigh, and begin again, adding layers of bright, happy colors to my painting. 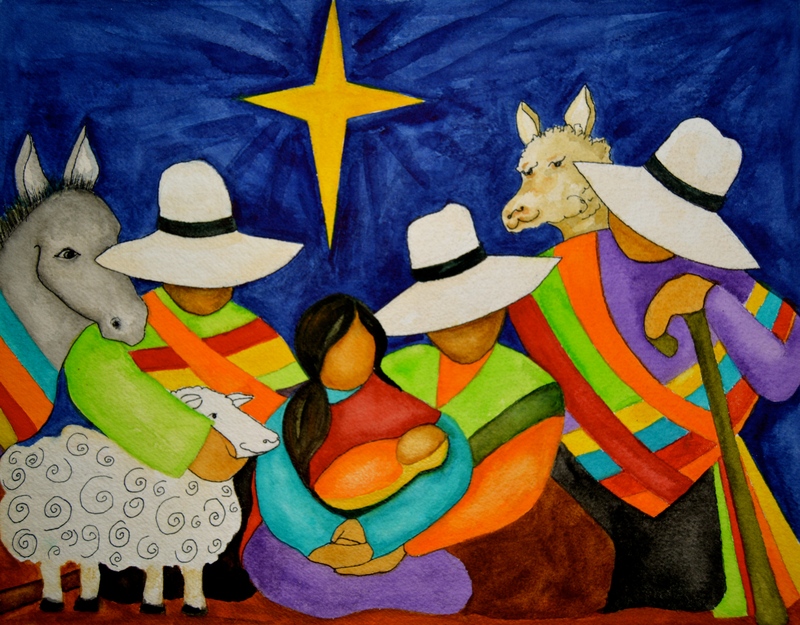 God with us – Christmas. God with skin on – Jesus – came to live among us. He humbly started His journey as a baby. I am always amazed at this truth. I take some pain pills for my lung, and quietly worship as I add more layers of beautiful color. Yes, Beauty came to our broken world, and to mine. Even my world of cancer. I am moved by your journey, both here within the throes of cancer treatment and abroad as you bring your love for God and graciously share that love and God with other women. Your art gives hope that is visible, art that can be touched and it gives words that are expressed in colors. Thank you for sharing your heart. I am thankful that you have God’s peace even while enduring the pain. God bless you. Once again your words and painting speak volumes, thank you.